Can Use Fenugreek for Diabetes Control? How To Use Fenugreek For Diabetes Control? Wondering what can do fenugreek to control your diabetes naturally? First, I want to make you clear that fenugreek is a plant, which is grown in Egypt, India and Middle East. It has been used since ancient times in the Indian medicine to heal various body conditions and diseases. Now, what’s really behind the action of fenugreek when it comes to diabetes control? The part of fenugreek that is used for medical purposes is its seeds. Indians, for example, use to dry its seeds and prepare several dishes. They can also prepare tea. If you like its taste, go ahead and prepare your own tea by yourself. It's very easy. Just crush the fenugreek seeds, and put them in hot, boiled water. Let them stay for 3 hours; after that, you can enjoy your tea. Sometimes, it might be difficult to find the herb at your local area. As everything is being commercialized in ourdays, you can find it as a supplement at a pharmacy store. Just ask and you can take it. How do the fenugreek herbs work in beating diabetes naturally? Is it good for diabetes type 2 or for any other type? This amino acid may stimulate the secretion of insulin from your pancreas. Another duty is to reduce insulin resistance. As a result, you may have low blood sugar levels. II. Another components inside fenugreek seeds are alkaloids such as gentianine, trigonelline, and carpaine. First, it may slow down the absorption process of carbs. Second, it may interfere by inhibiting the glucose transport. And the last and important action is by delaying your stomach emptiness. As a result, you may have less sugar in your blood stream. What other can do fenugreek herbs? What about warnings? Other effects of fenugreek are to raise the number of receptors for insulin in your red blood cells. And on the other hand, can help your peripheral tissues to utilize better the glucose. As you may see, fenugreek can help your pancreas to secrete more insulin and your body tissue to utilize it better. The final result would be your lower blood glucose levels and a feeling good sensation. Furthermore, fenugreek is also used to treat hyperlipidemia (hypercholesterolemia, hypertriglyceridemia); problems associated with gastro intestinal tract, or/and inflammation. What is the right dosage to use fenugreek for diabetes and other health conditions? 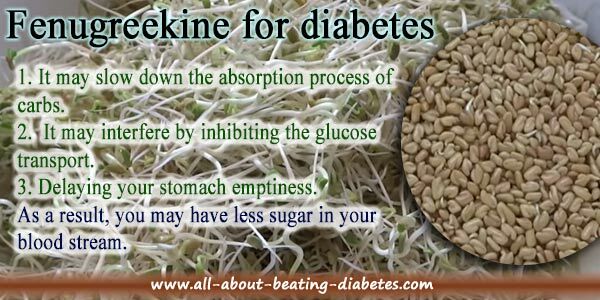 With regards to the right dosage of fenugreek for diabetics, I would say that there is not a determined limit for this purpose. Medical experts do think that it all depends on patient's data (such age) or/and health conditions. When it is used for medicinal purposes in diabetics, the usual dose is 10 - 15 g/day (single or divided doses) with meals to reduce the post-prandial blood sugar. In addition, the extract of fenugreek seeds can be used up to 1 g/day. As fenugreek can be used to also treat hyperlipidemia alone, the common doses in this case include 0.6-2.5 grams of fenugreek twice a day with meals. If it is used as a dietary food, then, there is no upper or lower limit set as it has been resulted safe while taken as food. If the patient is taking hypoglycemiant drugs, then, there is higher risk to cause hypoglycemia. Therefore, you should work closely to your doctor to adjust the dose of the drug you are taking. If the patient is also taking anticoagulants or/and antiplatelet drugs (to slow blood clotting); you should be careful. One of the effects of fenugreek is to slow blood clotting; therefore, there are higher chances for bruising and/or bleeding. Tell your doctor about this to adjust the dose of the drugs you are taking while using fenugreek. Some clinical facts on how fenugreek improves glycemic control. To make sure something works, always ask for any clinical facts . It’s not enough only the few data. So, in a research study in 1990 published in the European Journal of Clinical Nutrition, the type 1 diabetes patients assigned to 50 grams of defatted fenugreek – seed powder twice daily in addition to insulin therapy. Remarkably, their fasting glucose was lowered from 272 mg/dl to a baseline of 196 mg/dl. 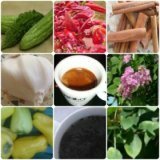 Another effect was in lowering the total cholesterol, LDL and triglycerides. In another study on type 2 diabetics, issued in Nutrition Research, in 1996, 25 grams of powdered fenugreek seed was given twice a day in addition to the medication therapy.The result was the decreasing of average fasting glucose from 151mg/dl to 112 mg/dl. Also the glucose levels two hours after meal were decreased together with the average A1C from 9.6 % to 8.4 % after 8 weeks.